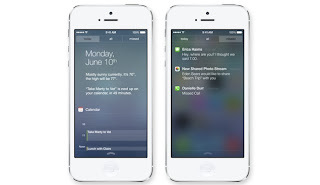 Apple unveiled the much awaited update to its iOS mobile operating system, iOS 7, on Monday at the WWDC 2013. In Apple's words this is "the most significant iOS update since the original iPhone." Not only does the next iteration of the OS bring a completely overhauled user interface design, it also adds many missing features that were being offered by rival mobile platforms. Nothing we’ve ever created has been designed just to look beautiful. That’s approaching the opportunity from the wrong end. Instead, as we reconsidered iOS, our purpose was to create an experience that was simpler, more useful, and more enjoyable — while building on the things people love about iOS. Ultimately, redesigning the way it works led us to redesign the way it looks. Because good design is design that’s in service of the experience. 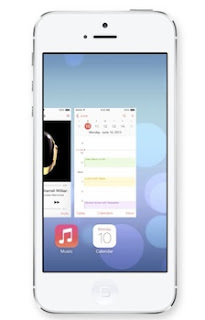 Here's a look at the 10 most significant new features of iOS 7. Apple has updated the Notification Center with a new translucent background replacing the linen like texture. It's now divided into three tabs- today, all and missed. While the today tab summarises your events, appointments, weather and traffic, missed gives a log of all alerts and notifications from apps.The 'all' tab includes all notifications. The Notification Center can be accessed by simply swiping down from the top from your home screen or even lock screen. Control Center gives you quick access to the controls and apps you always seem to need right this second. Just swipe up from any screen — including the Lock screen — to do things like switch to Airplane mode, turn Wi-Fi on or off, or adjust the brightness of your display. You can even shine a light on things with a new flashlight. Never has one swipe given you so much control. A lot of users have been complaining about the lack of a central destination that gives them access to the most used settings. Apple addresses that problem with Control Center which can be brought into view by swiping up from the home screen or lock screen. You'd see controls for turning on or off Airplane mode, Wi-Fi, Bluetooth, Do Not Disturb and screen orientation settings. You'd also be able to adjust the screen brightness, play, pause, or skip a song, connect to AirPlay-enabled devices or turn on new Airdrop file transfer feature tom the Control Center. Apple's also put handy shortcuts for flashlight, timer, calculator, and camera. Apple used to offer multitasking for select apps so it was more about switching between recently used apps than accessing a apps simultaneously. 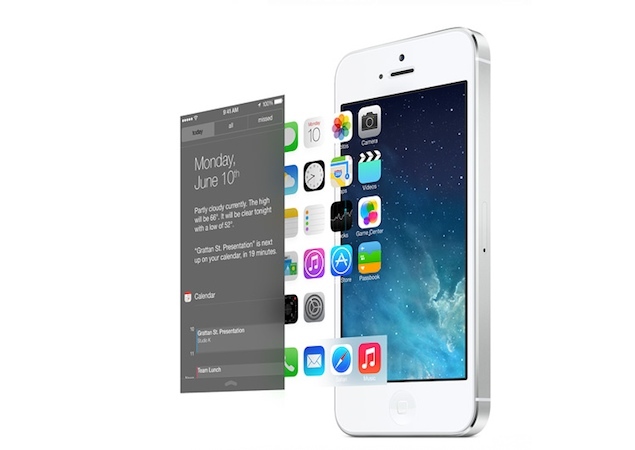 With iOS 7 Apple allows all apps to multitask and run in the background. It has also majorly overhauled the front end or the multitasking interface visible to the users. Pressing the Home button twice now brings up the preview screens of the apps you have open on your phone rather than their icons at the bottom of the screen. To quit an app, you just need to swipe it up and out of preview. We've seen this before on webOS, PlayBook OS and even on some HTC Android phones but it's a nifty way to handle multitasking. Multitasking is also intelligent as it adapts to your pattern of accessing apps, refreshing content at the same time interval. A smarter way to multitask. iOS schedules updates during power-efficient times. Like when your device is on and connected to Wi-Fi. So your battery isn’t drained unnecessarily. Make yourself available. Or not. You’re automatically visible in AirDrop to your contacts running iOS 7. But you can also make yourself visible to anyone nearby using iOS 7 or to no one at all. One tap in Control Center is all it takes. Recipients can choose to save whatever you send. When they do, the content is saved right where it should be — a photo in Photos, a pass in Passbook, a contact in Contacts, and so on. Those who use the Mac know that AirDrop is used for transferring files between two computers on the same network. The same feature now comes to the iPhone. AirDrop lets you quickly share photos, videos, contacts -- and anything else from any app on your phone with a Share button. You can just tap Share, then select the person (another iOS user) you want to share with. AirDrop offers transfers using Wi-Fi and Bluetooth and you don't need any additional setup. Transfers are encrypted, so they're secure. All content saved after the transfer is accessible from its respective app. It's worth pointing out that AirDrop is available on iPhone 5, iPad (4th generation), iPad mini, and iPod touch (5th generation) and requires an iCloud account. Camera in iOS 7 puts all your shooting formats — still, video, panorama, and now square — front and center. With a swipe, you can capture what you want the way you want Fast. And new filters let you do even more with each image. Give it a retro feel. Dial up the contrast. Or go black and white. Artistic license is all yours. The iOS 7 camera app offers a new way to switch between camera modes and includes a new 'square' mode. 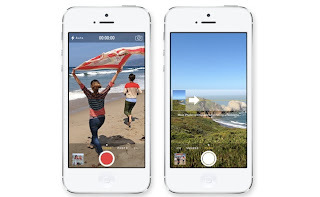 You can switch between all the modes - still, video, pano (Panorama), and square by simply swiping across the screen. The app also brings filters to apply effects to your photos before or after you shoot them in still and square modes. It's worth pointing out that filters in Camera are available on iPhone 5 and iPod touch (5th generation), while filters in Photos are available on iPhone 4 or later, iPad (3rd generation or later), iPad mini, and iPod touch (5th generation). You can apply filters to still and square photos. Pick a filter and see the effect before you take the picture. Or just take the shot and apply it later. If you ever change your mind and decide no filter is the best filter, you can simply remove it. Safari has also been overhauled to offer a distraction-free richer browsing experience as buttons and bars stay hidden until you scroll. You can go back and forward using swipe gestures. It now offers a unified search plus URL box, a new tab view that's not restricted to just 8 tabs and a Shared links menu along with the Reading List that lets you access the links shared by people you follow on Twitter from within the browser. It also remembers your password, user names and credit card numbers through the new iCloud Keychain. Safari can enter them automatically whenever you need to sign in to a site across iOS 7 and the new OS X Mavericks desktop OS. It comes with 256-bit AES encryption, for security. Type a URL or search term in the unified smart search field, and Safari automatically suggests the closest match to what you’re looking for. So you find the right web page fast. See your open web pages in a consolidated view that lets you scroll effortlessly from tab to tab. To close a page, just swipe it offscreen. See all the URLs in your Twitter timeline, who posted them, and what they had to say about them. Reading through the articles in your Reading List is quick and easy. 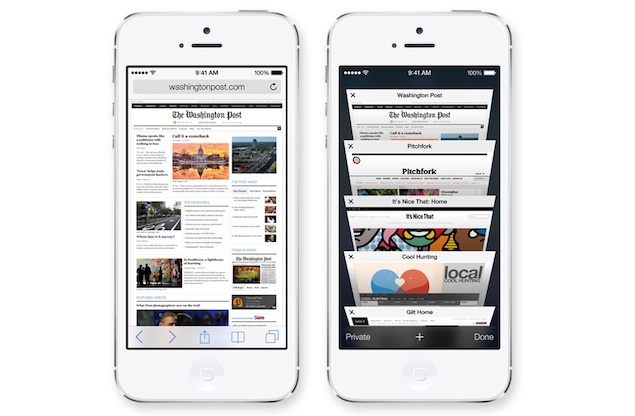 Simply scroll seamlessly from one to the next. Lots of things you do on the web require passwords. Now iCloud can remember your account names, passwords, and credit card numbers for you. And Safari can enter them automatically whenever you need to sign in to a site or shop online. It works on all your iOS 7 devices and your Mac computers running OS X Mavericks. And with 256-bit AES encryption, it’s highly secure. Every time you create an account, you can have Safari generate a unique, hard-to-guess password. And remember it for you. 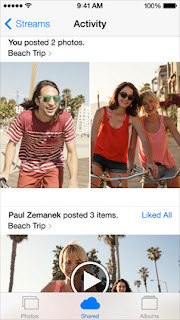 The updated Photos app offers a new way to browse photos through Collections, Moments, and Years, that smartly group of your photos and videos based on the time and place. 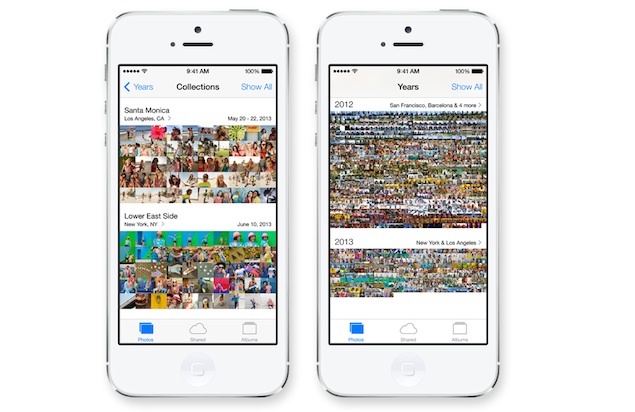 You can tap Years to see photos taken in that year. Each year holds Collections, based on different events such as trips or commencements. And in the Collection view, there are distinct Moments according to the exact location. It also includes iClod Photo Sharing through which you can share your favorite moments with people by creating a shared photo stream. They can post photos, videos, and comments to your stream, and everything appears on everyone's iOS devices in the Shared tab. 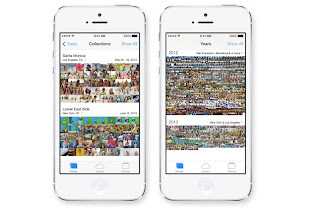 With iCloud, you can share your favorite moments with your favorite people by creating a shared photo stream. They can post photos, videos, and comments to your stream, and it all appears on everyone’s iOS devices — automatically. The new Activity view lets you see the latest updates from all your shared streams in one place. 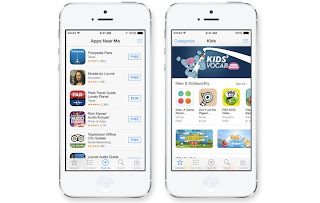 The new app store not only offers a new clean user interface, it also lists apps relevant to your location. 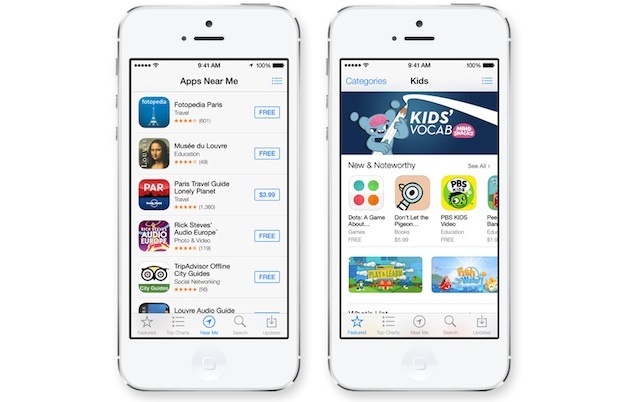 For instance if you're in a new city, it will offer apps that you might find helpful like guides, maps and others. It also offers a new Kids category. But the best feature has to be automatic updates that keeps your apps up to date without your intervention or you seeing the updates badge. 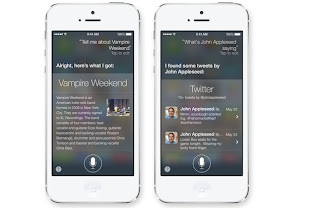 The Siri voice assistant sports a new look and new features in iOS 7. The voice behind Siri has been updated to offer a more natural speech pattern -- in a new female or male voice. 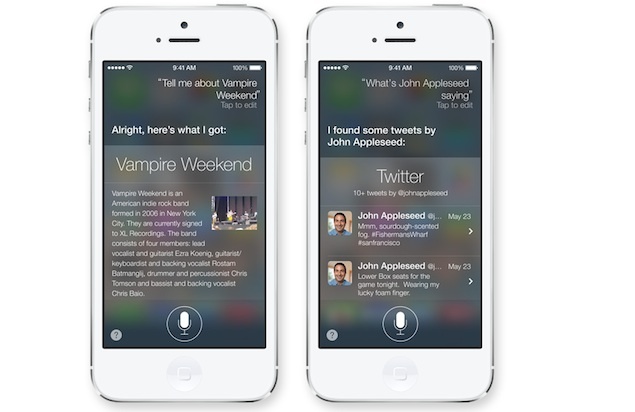 Siri now has access to more sources, including Bing, Wikipedia, and Twitter. It also performs new tasks like controlling apps and phone settings. Siri is also at the centre of iOS in the Car that lets users make calls, control music and check mails and messages while driving. It will be introduced in select cars in 2014. Siri now references Wikipedia to answer your questions. Want to know what people are tweeting about a certain topic? Just ask. 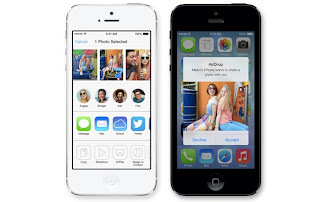 New security features in iOS 7 will make selling or using your stolen device more difficult. 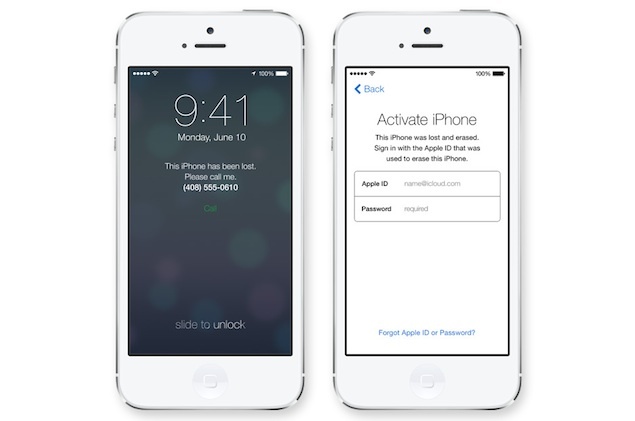 Turning off 'Find My iPhone' or resetting the device requires your Apple ID and password. 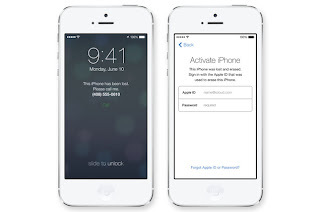 You are also required to enter your Apple ID and password to reactivate the device. 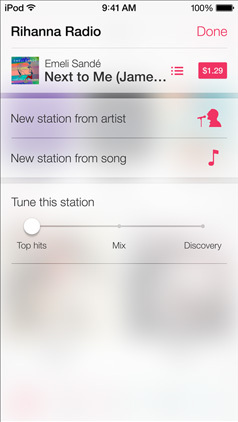 iTunes Radio features streaming radio stations you’ll love from day one — from the best selection of music. The more you listen, the more personalized it becomes. And it’s available on your iPhone, iPad, iPod touch, Mac, PC, and Apple TV for free. It’s radio re-imagined. Go from your music to more music. You can access Featured Stations, stations inspired by music you choose or already listen to, and more than 200 genre-based stations. Build new stations while you listen, and control the balance between playing the hits and discovering less familiar songs. View the History of everything you’ve heard or added to your Wish List. Then tap to download the songs you want from iTunes. New user interface, icons and overhauled native apps - In addition to to the above features, iOS 7 brings in a new design philosophy. iOS 7 features a new Parallax Motion effect on the home screen, so the background wallpaper shifts when you look at the phone from different angles using the phone's accelerometer bringing depth to the interface. The new Weather app features animations to depict the weather conditions. Folders offer multiple pages letting you group more apps. The new Mail app offers swipe gestures to organise your mail.